Rosie from Hull fighting cushing's disease. thank you jenny for commenting on Rosie....she is in no pain,but is very stiff on the back legs,she is on medication from the vets,for her condition,and is also on pain killers for her stiff legs. Thank you for your concern!! 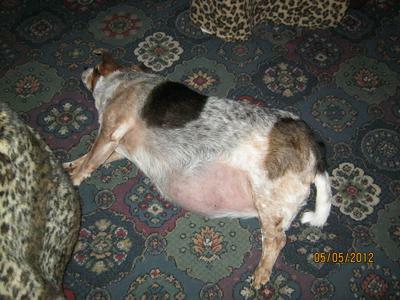 Here is a picture of Rosie...notice the hairless belly and enlarged abdomen. I hope this picture will show other JRT owners what to watch for! Comments for Rosie from Hull fighting cushing's disease. Thanks for posting this, I'm sure it will help other Jack Russell owners to know what to look for, myself included. I'll be sure to let the people in my Jack Russell group and at the dog park know about this. I hope the meds are giving Rosie some comfort!